Home › Pro Wrestling › Remember Sean Mooney and the WWF Event Center?!?! Remember Sean Mooney and the WWF Event Center?!?! You all remember Sean Mooney? 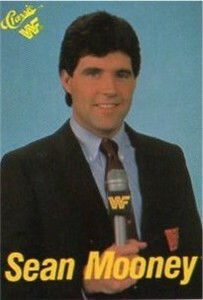 He was a play by play commentator and an interviewer in the WWF from 1988 to 1993. His Event Center segment on weekend television would advertise wrestling matches for the upcoming house shows in whatever area you lived in. Mooney would list several of the matches coming to a particular event, for example, in the Boston Garden and then we would get a promo from one of the wrestlers talking about what they are going to do in their match. My parents would probably hate Sean Mooney if they knew he was the direct cause of my endless hours of “Please, Please, Please” in order to get tickets to an event. Like an addict, I told myself, I could quit at anytime. I’d go to the house show agreeing this would be the last one for awhile until Mooney, in the Event Center, advertised a new card with new matches. His straight man approach brought an anomalic seriousness to the over the top shenanigans of the World Wrestling Federation. He could convince you that Damian Demento had a legitimate chance of winning the Royal Rumble and headlining WrestleMania and he would make you ponder whether or not Randy Savage could handle the antics of the vicious circus clown, Doink. In recent years, Mooney has been a reporter with Fox Sports Arizona focusing on University of Arizona football and basketball. Check out this video of Sean Mooney in the Event Center and it makes you wonder how he kept a straight face all those years. You’re right about Mooney being a straight-man. I remember an in-person interview with Ultimate Warrior (maybe during WrestleMania XI) where Warrior just shoved Mooney out the way and told him he didn’t deserve to stand with him. The old house show promos are sadly missed these days, but perhaps I’m being nostalgic. It would be interesting to test out whether an Event Center-type promo would increase attendance at house shows in a major city like Boston. I think part of the problem is that to do an Event Center, you need to know the card in advance, and we can all insert our own joke about live card line-ups these days.